Lisa graduated from the Royal Veterinary College in 1993. 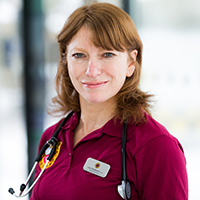 She then worked in a very busy first and second opinion hospital in London and gained the RCVS certificate in Small Animal Medicine in 1999. She worked in a number of private practices in the UK and abroad before joining Bath Veterinary Referrals in 2008. She has a keen interest in all aspects of canine and feline medicine. Any free time she has is spent pursuing outdoor activities such as cycling, hiking and kayaking, dancing or relaxing at home with her partner and cat Immi.